So, You're a Writer...: Random Act Of Kindness BLITZ! You know that right? (Okay, maybe not all people, but today is about focusing on the good.) It just so happens that our writing community is full of awesome people. More encouraging than a Hallmark card, more supportive than a Wonderbra, more... well, you get the picture. Take a second to think about writers you know, like the critique partner who works with you to improve your manuscript. The writing friend who listens, supports, and keeps you strong when times are tough. 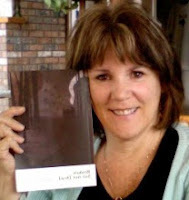 The author who generously offers council, advice, and inspiration when asked. So many people take the time to make us feel special, don't they? They comment on our blogs, re-tweet our posts, chat with us on forums. and wish us Happy Birthday on Facebook. To commemorate the release of their book, The Emotion Thesaurus, Becca and Angela at The Bookshelf Muse are hosting a TITANIC Random Act Of Kindness BLITZ! Because I think KINDNESS is contagious (and I deeply respect both women), I'm participating too! Today, I'd like to acknowledge Joylene Nowell Butler. If you want to find the spirit of the writing community, look no further. This woman is encouraging, helpful, and offers the very best advice. Seriously, if she didn't live 2,536 miles away, I'd take her to lunch. Doesn't everyone want to visit Cluculz Lake now? I do! Do you know someone special that you'd like to randomly acknowledge? Don't be shy--come join us and celebrate! Send them an email, give them a shout-out, or show your appreciation in another way. Kindness makes the world go round. Becca and Angela have a special RAOK gift waiting for you, too. Hop on over to The Bookshelf Muse to pick it up. :) Seriously, go now. How fun is this? Question of the week: Have you ever participated in or been the recipient of a Random Act Of Kindness? Congrats to Joylene. Off to check out her blog. And congrats on being blitzed yourself! I like randomly attacking people with kindness! Awesome! I love the header! I'm going to go check out her blog. Oh my gosh! what a wonderful ROAK gift! Very creative and thoughtful! Congrats Joylene! Great choice. :) Great blogfest, too. Great line .. more supporting than a wonderbra. The world need more random acts of kindness, and my novel talks about it. Not knowing many people, Carrie, I send you a random virtual act of kindness and wish you a wonderful day. I just hopped over from Peggy's place. This kindness trail is awesome! It's so exciting to see and hear of all the wonderful things that happen in the writing world. And can I just say, what an awesome gift. I already tweeted it. Congrats, Joylene! And thanks for the kind words and for sharing the love, Carrie! I'll be sure to stop in and visit Joylene. Her name is lovely and perfect for this "lovely" RAOKBlitz. Thanks for introducing, Joylene! I'll check out her books and blog now. Thanks for introducing us to Joylene. I came over to your blog to congratulation you on being RAOK Blitzed by Peggy. Congratulations! LOL. I couldn't understand why these kind people were stopping by to congratulate me on being blitzed. I was scratching my head and wondering what i missed. LOL. Oh, Carrie, what a dear and sweet girl you are. You brought tears to my eyes. And yes, if we were closer I'd take you to lunch and give you a big hug. Before you ate, of course. Thanks for making my day. Not sure what else to say. LOL. Gotta go blow my nose. I'm loving this BLITZ. I dropped off two books at the local high school library and they were beyond surprised. The blog header is gorgeous. I'm off to visit Joylene. I came over from Peggy's blog on you. This has been great. I love reading about everyone and what they've done. Joylene is seriously amazing! Excellent choice. Hope she gets lots of traffic from this. She is an inspiration! What a great post! If Joylene is half as amazing as you are, then that's pretty freaking amazing. And how talented are you with those blog headers? HELLO, artist! *Grins* Thank you, Giora. :) I agree. You too! I LOVE MY NEW HEADER! TOO KEWL! Thanks, Carrie. You're the best. Hah! Sorry about that, Joylene. I got home later than I intended. I wanted to send you a heads-up on Twitter. I'm so relieved that you like your header. :D Happy RAOK Blitz! Welcome, Patti! :) I'm enjoying this, too. "...I'm Mark, and I can't believe Carrie beat me to this line :)~"
Such a beautiful photo in that header!! i love this fest! you all are great! its inspiring to see all the giving! What a fantastic RAOK. Gorgeous blog header. I just came over from Peggy's blog--congratulations on being named in her RAOK. And now I'm off to visit Joylene. This RAOK event has been truly fatnastic. It's wonderful seeing the community come together to celebrate kindness. Yesterday was a bit chaotic, wasn't it? I'm catching up, too! The blogosphere has a serious case of the warm and fuzzies. :D Heck yeah! You are so right! Kindness does rock! These acts of kindness are great. Great header gift. Yeah, it does! :) Thank you, Michelle! They're re-energizing the writing community. :) Thanks, Clarissa! Thank you, Eagle! :) Hooray, indeed! Great idea! We don't make it alone in the writing biz. More support than a wonderbra ---> HILARIOUS GIRL! We certainly don't. :) Thanks, Julia! You too!